Just below the center of Yogyakarta you will find a lovely neighborhood filled with restaurants, cafe’s shops and hotels. And in the midst of all of these, tucked away in a quiet lane, you will find the stylish and newly opened Trava House. Warmly welcomed by the friendly smiles of the staff you will be guaranteed a good stay. 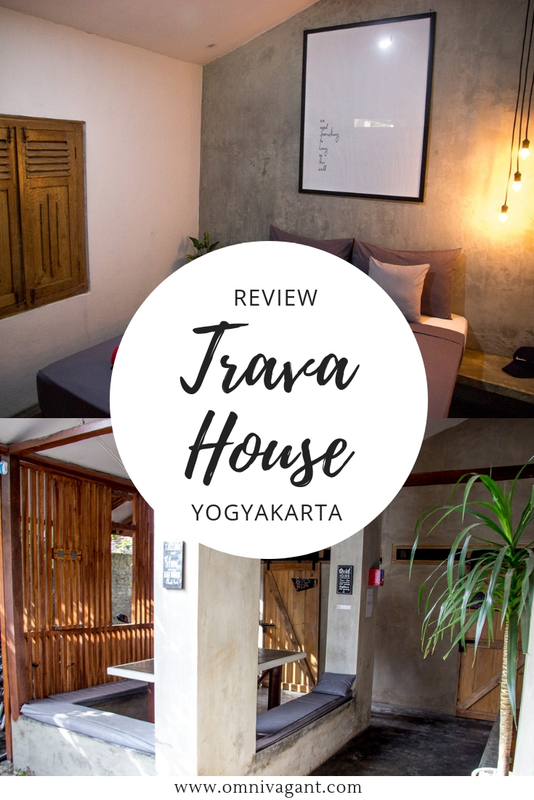 Read here everything you need to know about Trava House Yogyakarta, the perfect budget accommodation for couples and backpackers on a budget. 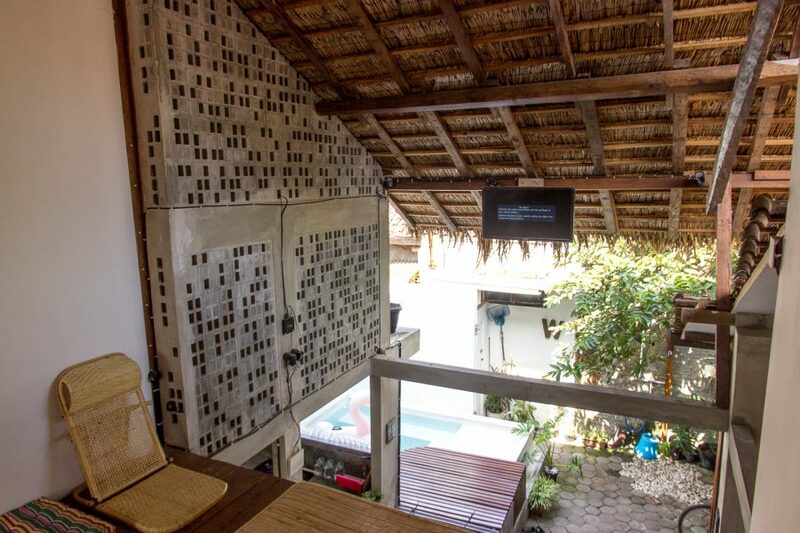 For anyone looking for a quiet oasis away from the hustle and bustle of Yogyakarta, Trava House is the place for you. 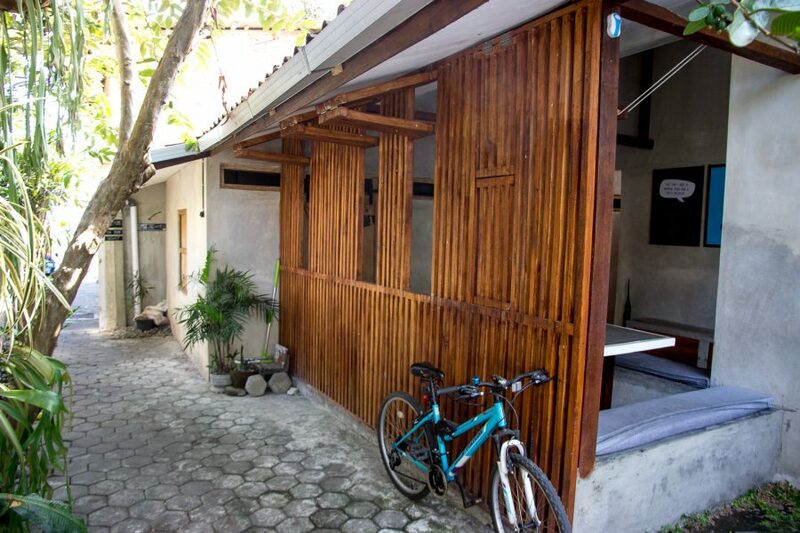 With only 4 private rooms and 1 dorm (for 4 people), you will be guaranteed a quiet and peaceful stay. The private rooms are all equipped with a double bed, two plugs to charge your phone and all your other gear and a fan. Above the doors there is an opening, which has been closed with mesh, to prevent from mosquitoes entering your room. Please note that the rooms do not have A/C, but with the temperatures being much lower in the evening we realized we didn’t need A/C, and the fan was enough to keep us cool in the room. The rooms are all decorated in an industrial style, a bed made out of concrete, with concrete and white walls combined with warm wooden tones of the window shutters and barn style doors. There is also a convenient small rack, located next to the door to dry your towels on, and place some of your amenities for easy access. The rooms, although small, felt rather warm and cozy and the comfy beds and firm pillows guaranteed us a good night sleep. The rooms do not have a private bathroom, but instead share 2 showers and 2 toilets, located in the next hall over. 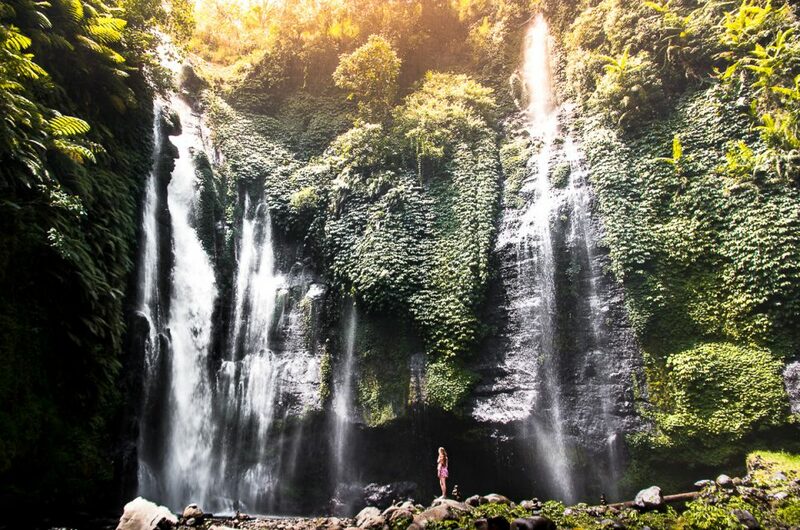 The showers are the waterfall type of showers, and with only cold water, a perfect refresher after a warm and sweaty day in the city of Yogyakarta. Staff was cleaning the common rooms and facilities on a daily basis. Find some photos of the rooms below to give you a better idea of the space. Trava House has a large range of shared rooms and facilities. On the ground and main floor there is a large table with benches available, in the style of a large booth, ideal to work or socialize with your fellow travelers. 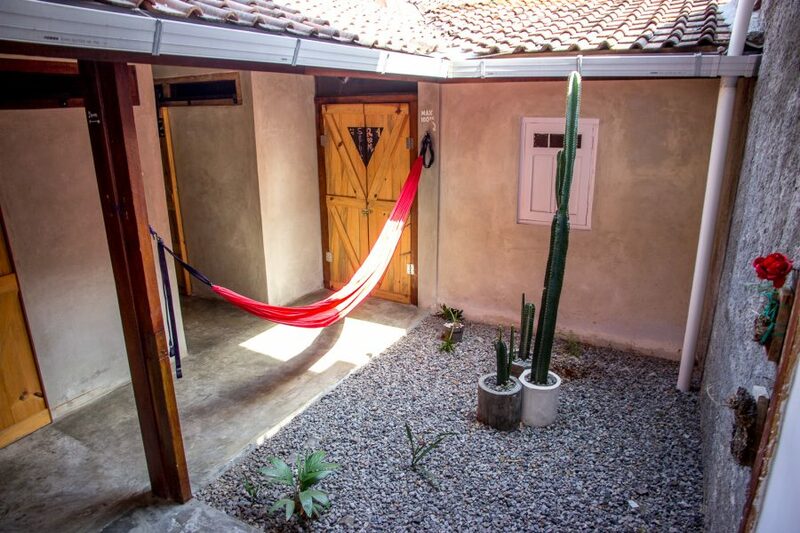 Further back in the premises you will find a hammock, for the ones looking to take an afternoon nap outside or enjoy reading a book or magazine. Besides that there are the shared showers and toilets, with a separate large sink and mirror located in one hall and next to the common space you will also find the shared kitchen. 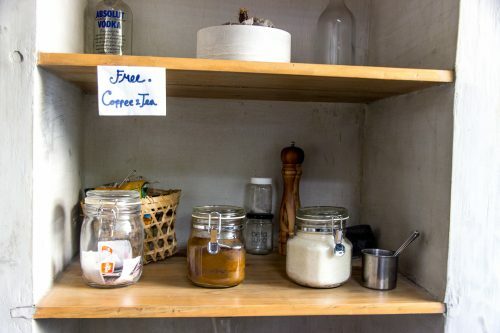 The shared kitchen is equipped with free drinking water, perfect to fill up your reusable water bottle and a water boiler with unlimited free tea and coffee. 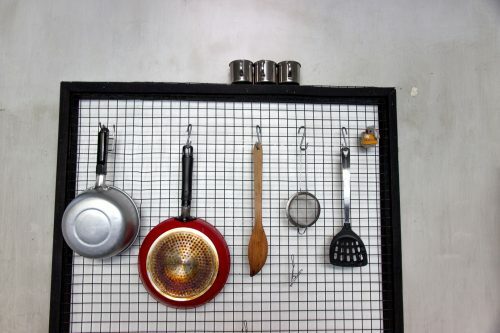 If you prefer your water cold, or like cooking, there is a big fridge available where you can store your products, and a range of pots and pans with gas stoves to cook a quick and tasty meal. But you don’t have to worry about breakfast, the wonderful staff has this covered. Every morning between 8am and noon we were served a different, and each just as tasty, breakfast. 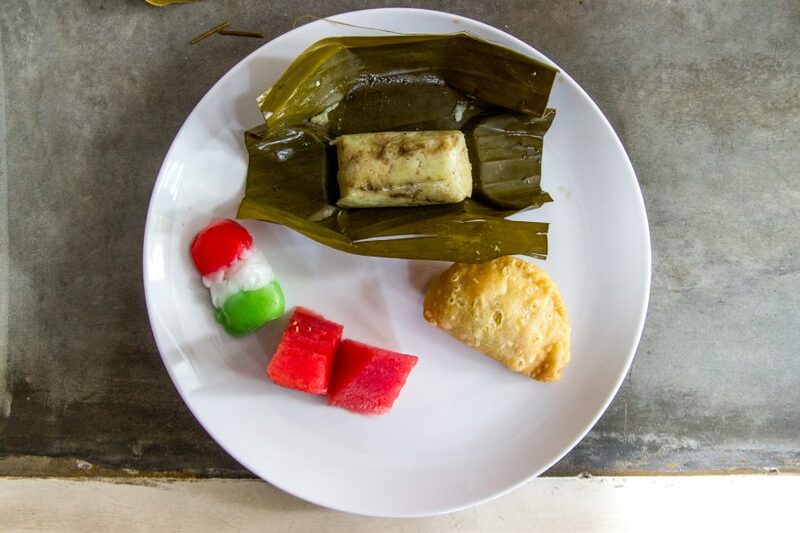 It ranged from fresh fruits with coconut rice wrapped in banana leaves, to small treats or delicious yellow rice with a range of savory treats. 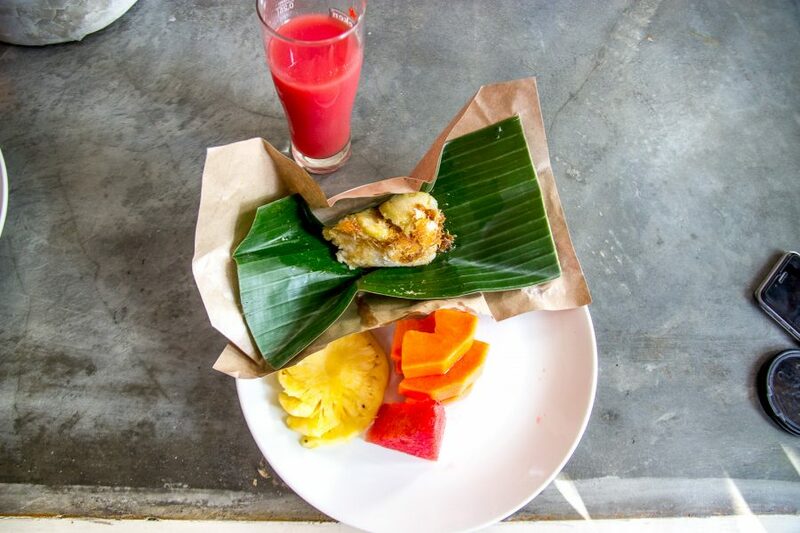 Every morning the breakfast was served with fresh juice. During our stay we had the pleasure of enjoying 4 different types of breakfasts and every morning we were happily surprised with the delicious treats that awaited us. 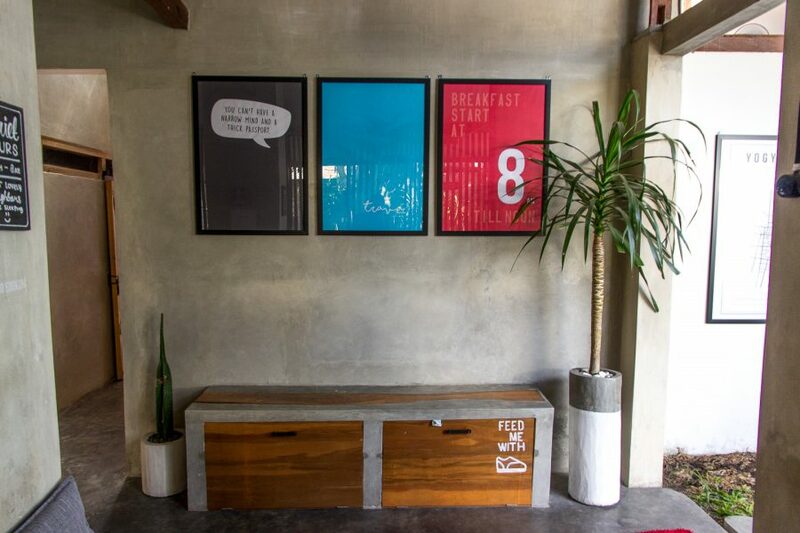 Find some photos of the breakfasts and kitchen below! 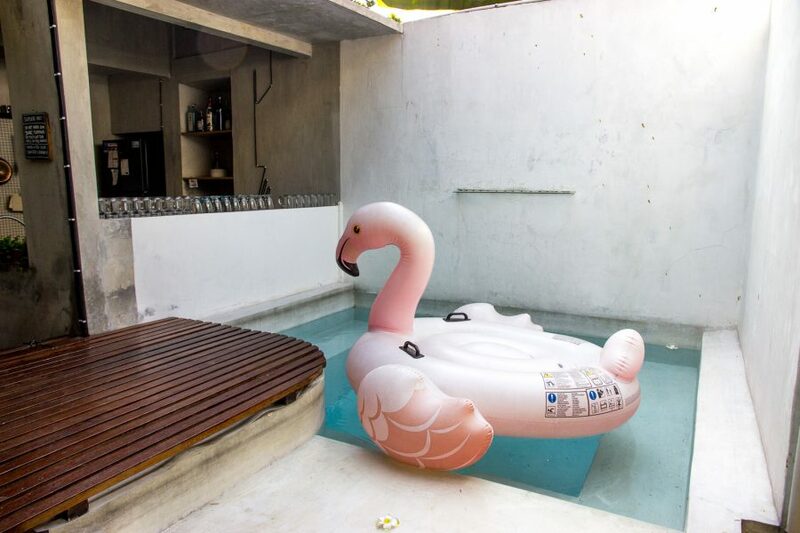 And lastly, to top it all off, Trava House has another common space located on the first floor and a small dipping pool with refreshing cold water. 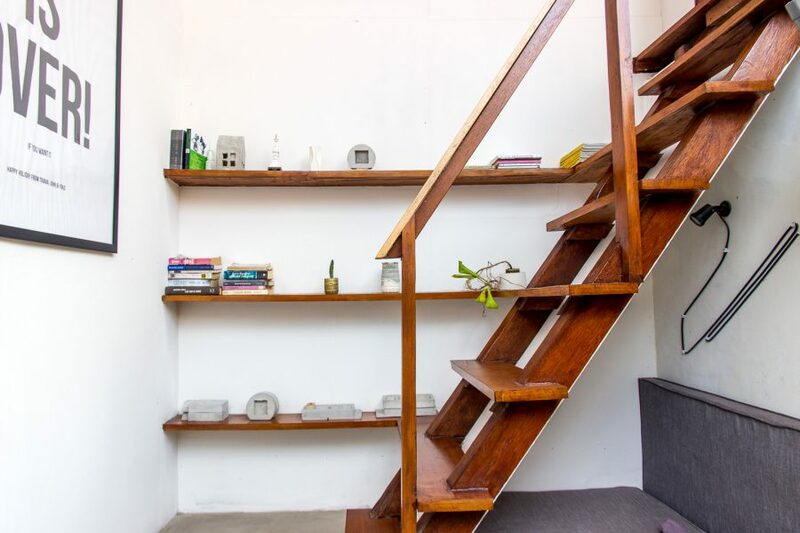 The second common space can be accessed via stairs in the back and consist of a wooden platform, where a small desk, a comfy couch a fan, plugs, some sitting spaces on the floor and a TV. The perfect space to either work, since this place has great wifi, or enjoy a bit of relaxing time. 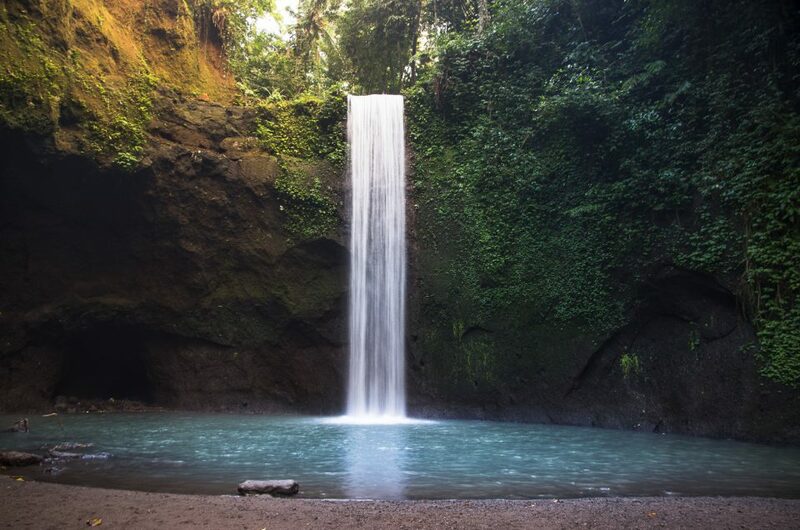 The small swimming pool, or well more a dipping pool, is located next to the kitchen and is perfect for a quick refresher from the Indonesian heat. 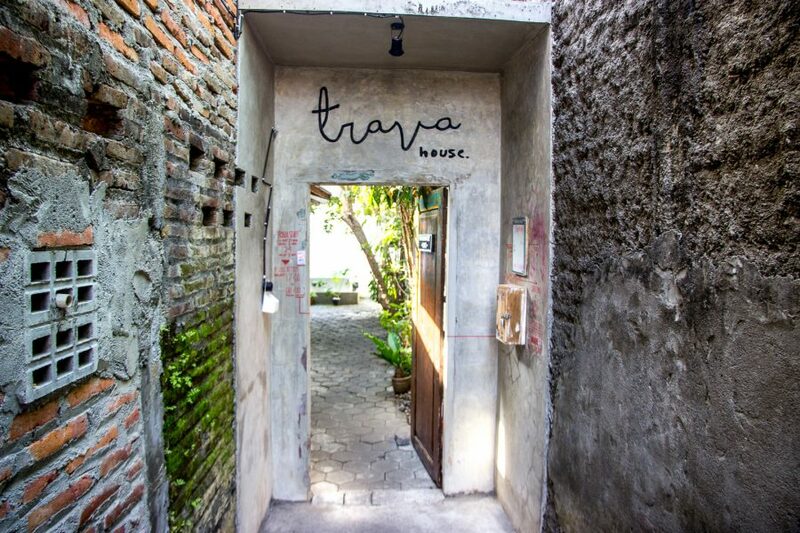 As I had mentioned above Trava House is conveniently located in the midst of restaurants, shops and located closely to some of Yogyakarta’s main tourists sights. 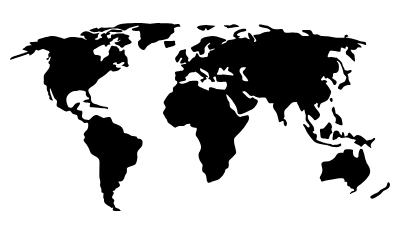 To give you a bit of a better idea, find below a map with Trava House in orange. 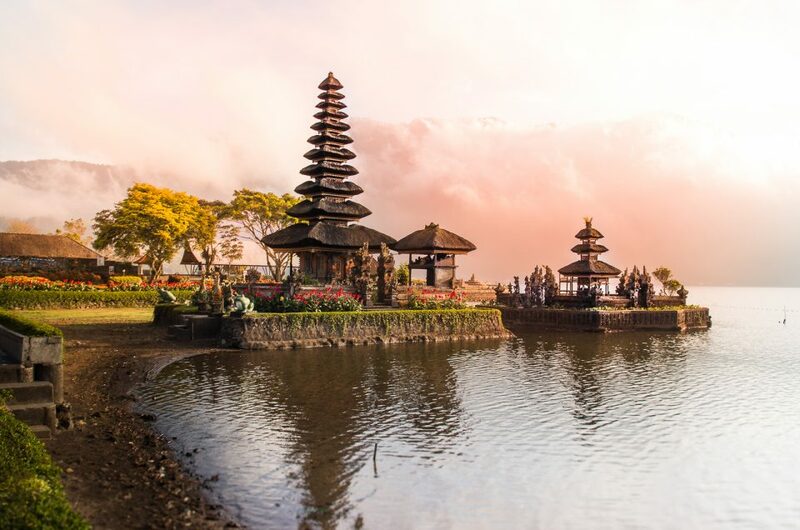 The tourist sights, including Taman Sari and the Palace are in yellow. Facilities such as supermarkets, a motorbike rental place and laundry services are in purple. And lastly, some of our favorite restaurants in this area in blue! 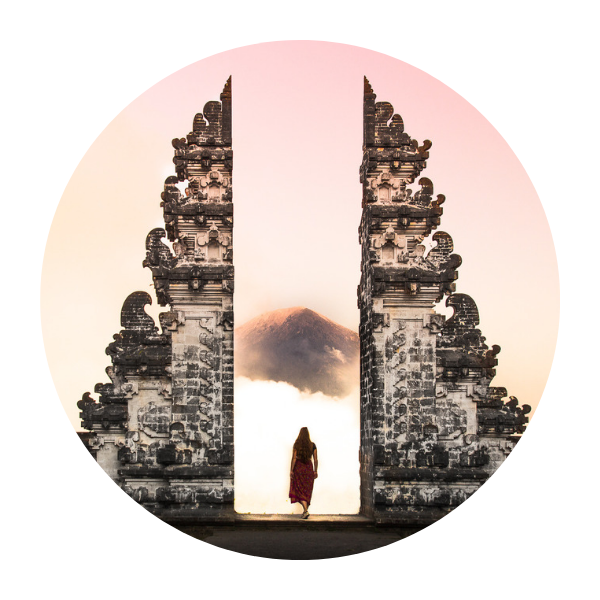 Besides that, don’t hesitate to ask the staff for any recommendations, they are always willing to help.Don’t forget to check out all my other blogposts on Yogyakarta to see what else there is to do in this beautiful city. So now that you have all info on Trava House Yogyakarta, there is only one more thing you can do, actually book it for your upcoming stay. You can find all available rooms, including the dorm, on Booking.com. You can check the latest rates and availability and easily make the booking. 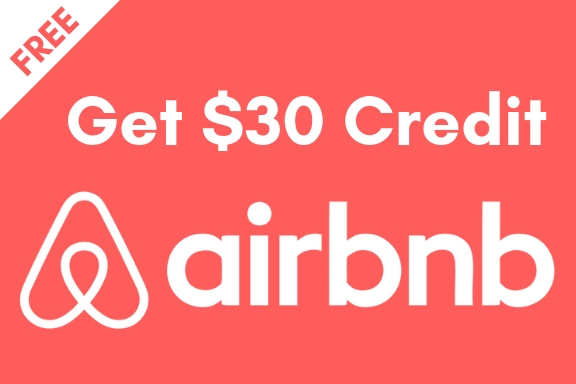 Be sure to book it now before it is too late!